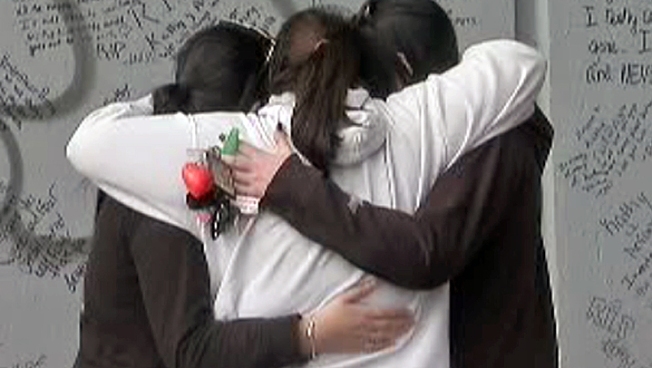 Friends mourn the loss of Ariana Napolitano and Kathy Sanchez. A Facebook post appeared to shed new light on why two Copiague teens were struck and killed by a Long Island Rail Road train Tuesday night. "Were they walking on the tracks?" reads the post, said to be from one of the victims' moms. "Yes, which I have come to find out was something they did as well as many other of their friends." The message was left on the Facebook page of victim Ariana Napolitano, 18. It called the teens' deaths a tragic "accident." The Napolitano family was unavailable to comment on the Facebook message. Ariana Napolitano's wake was held Friday at a funeral home in Massapequa Park. Napolitano and her friend, Kathy Sanchez, 18, were killed on elevated LIRR tracks a half-mile west of the Copiague train station. MTA police are investigating; but have yet to explain why the girls were on the tracks. A source close to the investigation told NBC New York that the teens did try to avoid the oncoming train just before they were struck. "Everyone is wondering why they were up there and exactly what happened," said Amanda Devereaux, a friend of the teens. A tearful Devereaux and others left flowers and messages of love at a makeshift memorial just beneath the tracks. "I don't understand," said friend Tina Martin. "They were both pretty afraid of the tracks. I mean, I don't know." MTA detectives questioned mourners at the memorial site Friday and even scanned messages written on a concrete wall for any leads. Nearby, LIRR workers put up 8-foot-tall fences to block access to the elevated tracks. "It is the LIRR's practice to fence off any area of the right-of-way that may become a place where young people visit to memorialize victims of train accidents," said LIRR spokesman Sam Zambuto. "I have never seen any kids going on the tracks," said Sal Ferrara, who owns a business across from the tracks. Surveillance cameras from that business point toward the tracks; but Ferrara said investigators found no leads when reviewing the video. The father of Kathy Sanchez wouldn't discuss why his daughter was on the tracks, but Carlos Sanchez did remember a "beautiful girl" who was about to register for college and pursue a culinary career. "She lived every day like it was her last," said uncle Rafael Sanchez, who explained that Kathy had overcome lupus to graduate Copiague High school as an honor student. Ariana Napolitano was a Suffolk community college student who loved photography, according to her stepfather, Kevin Urban. "She was just a great kid."